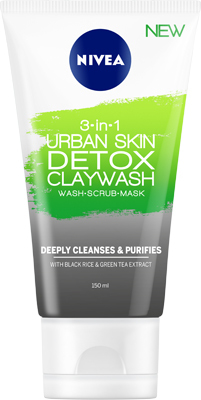 NIVEA Urban Skin Detox 3-in-1 Claywash is a multi-performing face wash, scrub and mask, formulated with black rice, organic green tea extracts and natural clay to effectively remove dirt and pollutants with its powerful absorption and detoxifying properties. Used daily as a face wash or scrub, the 3-in-1 deep-cleaning formula, thoroughly cleanses, exfoliates and works perfectly as a mask, to complete the ultimate detoxifying skin care routine, helping to remove impurities and mattify and clarify the skin. I have used a similar product before and found it was fantastic so when I was able to try this I had high expectations. I used it all three ways and I thought the mask was probably my favourite. I think the clay really drew out all of my impurities and left my skin feeling tight and super cleansed. I think that it is super versatile and if you were travelling you could replace a mask, scrub and face wash for this one product. I found the face wash wasn't too harsh but it did a fantastic job cleaning. I didn't think the scrub was very different to the face wash but if I used slightly more product and less water then it really exfoliated my skin. I have sensitive skin and I thought that it was great, it definitely wasn't irritating or too harsh but if you wanted a really good clean you could just scrub harder to get it. As someone who is very set on the skincare that I use, I went into this trail with an open mind. I've heard so many reviews about clay being super beneficial to your skin, so this was a great opportunity to see for myself. As I have very sensitive skin (and allergies) I firstly did a skin patch test, which thankfully this product passed! The consistency of this product is really cool - it's smooth, thick and creamy which makes it really easy to apply. I tried this all three - scrub, wash and mask. Honestly, I don't think the mask made any difference to being used as a wash. It definitely cleaned my skin thoroughly, but I can't say it really benefitted my skin in comparison to other products. I will say that this product gets all your stubborn makeup off and doesn't dry out your skin which is definitely a bonus. Overall, would I repurchase? Probably not, I think I'll stick to my regime. But it's definitely a product that could benefit others. The very first time I used this facewash I was going through a bit of a bad skin phase - and literally the day after using this I could see my skin had cleared up overnight. I used this a few nights a week since and I just love the way it leaves your skin feeling so clean and absolutely refreshed. The packaging for this facewash is fresh and clean looking and is a good representation of the product inside. The facewash itself is a grey charcoal colour. There is no strong smell - but it does smell fresh. The facewash does contain small beads that I’m not really a fan of and to be honest I think this facewash would have been perfect without the beads. Overall I loved this facewash and definitely noticed pretty immediatel results on my skin helping clear up some congestion. I will definitely continue to use it and would recommend to anyone. Don’t rate the mask function, best use is as a facewash. Anyone - but particularly anyone with congested skin. I have been using the Urban Skin Detox 3 in 1 for a couple of weeks now and it’s wonderful. It smells masculine but also really clean. The smell is phoneomial! This product is so nice I’ve had to start sharing it with Mr Beauty as he keeps borrowing it! I began using as a wash however it doesn’t foam up like I’m used to. I much prefer it as a scrub. It feels really cleansing and the black rice does such a good job of exfoliating but it’s also gritty enough but doesn’t feel damaging to my skin. The rice feels nice and small and the scrub has a lovely grey colour so it feels and looks quite natural with the charcoal. Both Mr Beauty and I have also tried it as a mask and it’s overly drying and stiff like a traditional mask. It’s nice and refreshing! Our skin is also bright and clear! Firstly I would recommend this for people with oily skin, not dry skin. I got to trial this and I was pretty excited because of the black rice and green tea extract ingredients it advertises on the front of the product. However, when I look at the ingredients it just looks like a lot of chemicals I don’t know of. I love that this is a 3 in 1 product for wash, scrub and mask. The basis wash was good to remove your makeup or dirt/dust from my face. Nice and easy to use and had a good texture. If it didn’t want to scrub/exfoliate my face and just wash I would just apply less pressure. The scrub worked alright as well but not great. I looked at my face after and it wasn’t too exfoliated looking but good enough, kind just dry looking. The mask I only used once, it’s always nice to apply a task mask so I like that you can you it for a mask as well. I didn’t really like the overall mattifying effect is has, as my skin is already dryish (not oily), and it made my skin feel tight and uncomfortable. Oily skin, not so much dry skin. Thank you to the BH team for sending me this product to trial. This is a 3 in 1 product from Nivea that aims to act as a wash, scrub and mask and features black rice and green tea extracts. The charcoal-coloured gel is dispensed from a squeezy tube and has gentle micro crystals that help to exfoliate the skin. I mainly used it as a daily scrub/wash and I found that the product is excellent at effectively removing dead skin and improve skin texture. However, I felt that the product did leave some residue on the skin so I preferred to finish off the routine with my regular foaming cleanser. The product may also be used as a mask, which I found less effective at removing impurities as other deep cleansing masks as the kaolin does not dry on the skin. It is however more convenient for those with busy lifestyles as you can just leave the gel on the skin for a little longer during your routine in the shower.  Overall, I enjoyed the wash (more as a scrub) and it is an economical and easily accessible product. Thanks for letting me trial this BH! I was eager to try this product as I really like the idea of multipurpose products as they can save a lot of time are really great especially when travelling. The Nivea 3-in-1 Claywash comes in a squeeze tube which I love because it makes it more hygienic than a lot of other clay products, especially masks, which often come in tubs. The Claywash is quite thick and can be a little hard to squeeze out. It has a pleasant smell and the texture is quite nice with the rice to exfoliate. I mainly use the Claywash as a wash/scrub as I prefer other clay products without gritty bits as a mask. To use this as a wash, I rub the product all over my face gently so the exfoliating rice bits aren't too harsh on my skin and use plenty of water to thin it out. I use this as a scrub mainly on my T zone where my skin gets most oily and I don't have to be as gentle with it. Overall the Claywash leaves my skin feeling fresh and cleans all the dirt out of my pores really well. Absolutely loved this product! I’ve tried many clay masks but none like the Nivea Urban Skin Detox. I loved the packaging which makes it easy to access and apply. The quantity (150 ml) was a very reasonable and generous amount for the price , Nivea definitely provides more of the product than most clay masks I’ve tried. I never tried a product with either black rice or green tea let alone together and feel that these ingredients work really well together. I loved how the mask didn’t dry within 30 seconds like most clay masks do. The mask helped detox my skin but left it moisturised once I washed it off. This mask is something that I can see myself using during the cold and dryer months of the year as my skin is often dryer the normal. Overall the mask left my skin feeling fresh and new. Thanks BH and Nivea for including me in this trial. The first thing I noticed about this product was the scent. It smells exactly like my expensive Chloe perfume with floral notes which I really loved. My fiancé also did this trial with me (he has very dry/sensitive skin and adored this product) and he really enjoyed the scent too regardless of being quite feminine so is definitely unisex. The product can be used as either a scrub, wash or a mask. I mostly used it as a scrub or as a wash if I was in a hurry but always left my skin feeling really soft and cleansed without the dryness that is attributed with charcoal washes. My fiancé found that the product actually cleared up quite a lot of his skin irritations and left his skin smooth and free of dead skin which is magic in itself. We will definitely be purchasing this again in the future and I can't see us being without it anytime soon. I would definitely recommend this product to anyone. It's silly but don't forget to double check that you clean your ears and nostrils after use. Flu season brought this to my attention which was mildly terrifying at first lol. Quite literally anyone. If my fiancé can use this very comfortably with his skin concerns then anyone can! I was part of the free trial by Beauty Heaven, so thank you very much!! I was very excited to try this, clear simple packaging and when I opened it,it has really nice scent. I highly recommend using it in the shower, as it leaves a bit of grey water marks or can get onto your clothing and also it washes off better because when I wash the first time I realise there was a bit of residue left. There's not much lather to use it as a cleanser, so afterwards I kept using it as a scrub as it had small exfoliating beads in it. I also tried it as a mask by putting it about 10mins before showering,I didn't think it was worth doing so as it didn't really make a difference between scrub/ mask,I rather use my normal sheet face masks. Thanks again for allowing me and this instance my partner to try this! A clay mask in a gel wash formulation! I really enjoyed the trial of the Urban Skin Detox Claywash. The packaging is inkeeping with Nivea’s brand and appeals to the modern urban girl who is trying to protect her skin from a harsh city environment. The thing I love most about this wash is the smell! It’s just so pleasant to wash your face with it because it smells amazing!! Clay products tend to have quite a musty dirt smell but this one smells incredible. The formulation of this product is also unique for a clay formulation. It’s more of a clay gel formulation. Not as pasty as a clay but also doesn’t lather life a gel. It’s very interesting. In terms of using this product as a scrub I think it falls a little bit short. I prefer scrubs that have a gritty sugar like exfoliant in them and this product has micro beads. It still acts as a scrub but I think I could be better in that regard. The claywash is easily spread over the face as a wash or scrub. It does not lather. I did not have an opportunity to try it as a mask and don’t generallt use masks much either unless I have a lot of congestion in my skin. It left my skin looking clear and fresh and feel soft and smooth. There was no residue. The thing that I really liked about this product is it did not leave my skin feeling dry or tight in anyway. I have dry/combination skin and clay masks sometimes leave patches of my skin feeling quite dry and tight. This claywash did not have that effect at all. It had all the clarifying benefits of a clay mask without and of the negative effects. I massive win in my book! I will definitely be continuing to use this product in the future. Dry/combination skin. Purifying dirt and leaving skin feeling soft and smooth. As a bride to be, I’m always on the look out for great face products that will have my skin looking great on my big day. So I was excited to try this one! I immediately liked the multi use of the product. I usually like to wash my face in the shower so I first used it as a wash. The packaging of the product is nice and similar to many other face products. I first noticed the very thick consistency of the product and the grey colour. This made it quite messy to apply. However, it made my skin feel really clean and purified afterwards! I also used it as a scrub, which really exfoliated my skin, and as a mask which I left on for 5 minutes. My skin felt clean and smooth afterwards, but it was definitely messy! As I would usually use this product in the shower this didn’t bother me too much but the thick consistency was the only thing I didn’t like about this product. It was definitely a really good product in which I highly recommend for anybody looking for a nice clay mask that’s refreshing yet does the job for the skin. There was also no chemical scent to this mask which was also a plus. I use this normally after using my cleansing oil as my double cleanse as well as my mask so I won’t need to put on another mask. So it’s great, and saves a lot of time. I preferably like to wet my face prior to applying the mask :) just personal preference. Anybody! Sensitive skin-ers should definitely give this a go! As I found that this was a very versatile all rounder product, I'll review each section of what it is meant to do individually. Before that, I'll start off with the packaging, I found the tube with the snap top lid easy to use and I was able to smoothly control the amount of product to avoid overusing it. I would've preferred for the packaging to be slightly "prettier" but I guess the product is relatively unisex so this is suited. The scent was not offensive and just mild, I did notice that in application, the product went onto the skin smoothly and almost paste-like(which I liked). The colour of the product was grey which is great because you can see exactly where and how much is being applied to ensure even application. Face wash: I dropped a star because of this functionality. I found that it wasn't effective at removing all of my makeup, and spread my eyeliner & mascara around my face. This couldn't be removed with multiple washes and due to the waxy/clayey nature of the product, I needed to use a makeup remover after washing and drying my face to get all the excess residue of my makeup off. I did find that it left my face with that clean, refreshed feeling- but as a daily makeup user, this was a bit of an inconvenience. Scrub: I absolutely loved this functionality, which is why I continue to use it inspire of the aforementioned makeup issue. The micro beads in the product are the perfect size and texture. I feel that it is just enough to scrub away all my dead skin yet not so harsh that I can't use it daily (as some other scrubs are on the market). Mask: I hate hoarding products and love that this one product also triples as a face mask. It has a lovely tingly feeling when using this as a mask and doesnt feel "tight" or drying when left on for too long. I found that my skin felt super plump and soft after using this, followed by giving it a good scrub. All in all I love the versatility of this product and the fact that it is so portable and such an all rounder. I can imagine this being the perfect product for those travels where you just can't afford to take multiple products but still want to look after your skin! My husband has relatively oily skin and he has found that using this daily has improved the texture and oiliness of his skin in just a couple of weeks. This comes highly recommended and is definitely worth a shot! I was kindly sent this product for a trial. I have been using it for a few weeks and have found it to be a very good cleanser and scrub for everyday but slightly too strong for my skin everyday. I moved to using this three times a week as I have very dry skin with an oilier t zone. This worked better for my skin. I however found this product was not the best for my skin as a face mask as it dried the skin and didn’t really achieve anything else. I highly recommend this product as a scrub and cleanser for all skin types and as a mask for oily and acne prone skin. Using in the morning before makeup to start with a nice matte starting point. Any beauty product that is multi-use, I really appreciate, especially for travelling. I've been using the Nivea Urban Skin Detox 3-in-1 Claywash for a good 2 weeks and I really love it. My skin completely agrees! Starting off with the scent, it smells so nice, light, subtle and not overpowering at all. I enjoy the scent and think it's a good amount of smell to the product. The clay wash is a mask, exfoliator and daily wash - I tried all three and really stuck to using it as a daily wash to see how it felt on my skin afterwards. I love the small exfoliating particles in the product - often, exfoliators may have particles that are harsh on the skin however this one is really nice and soft. It scrubs the skin gently and creates a super soft and silky texture on the skin. I have combination/oily skin and I feel this wash really cleansed my skin nicely after a night's sleep as well as after taking my makeup off. It completely removes any stubborn makeup and leaves my skin feeling hydrated as well. I have always had mixed feelings about Nivea; it’s such a hit and miss brand for me. But I was surprised and super happy that this mask/wash worked out for me! I’m very happy that it wasn’t full of plastic beads and has caught on to natural alternatives. The scent was also quite nice, but still less natural than I’d ideally like. But it wasn’t overpowering or gross. My favourite way to use the product was by far as a mask. I love face masks and using it a few times each week made a substantial difference to the clarity of my skin. After leaving it on for about 10 minutes or so, my skin felt softer and cleansed and not dried out. As a wash it’s still awesome, but it’s a pretty intense exfoliant so I would only use it once or twice a week max. The only fallback to the product overall was in the packaging vs product texture area. The tube really made a mess. After only a couple of uses the cap was covered in product and needed to be cleaned. 100% will purchase again and continue to use on a regular basis. I was pretty keen to try this product so was very excited to be invited to trial it. I used to use Nivea face wash a long time ago and it kept my hormonal skin in check most of the time. Kaolin clay - one of the main ingredients- is an old favourite for oily skin, it has amazing drawing properties. The container it comes in is very easy to use with a flip top lid which it sits on meaning all the product is sitting there ready to come out, no banging the end of the tub trying to get the last dregs out. It's also in a thin plastic so if you wanted to get every last drop you can cut the top off. The smell is like every other Nivea product I have tried, I'm not sure how to explain it but it is a very distinct smell that I associate with Nivea. The consistency is a thick, gel like substance, dark grey in colour with small spheres in it. I used mine in the shower, so I wet my face then stepped out of the water to apply it to my face. The first time I used it I applied a piece about the size of a 20c coin and massaged it into my face and neck, it was nice and soft, the granules were very delicate and didn't feel like they were scratching my skin. I then left it on while I washed my hair and body before washing it off under the shower. It removed very easily. One thing I liked was that there was no tight dry feeling as the clay set, it stayed in its gel like state so my skin didn't feel like it was being stripped. My face after felt nice and soft and smooth and looked quite hydrated. The next time I used it I used it as a wash/scrub and didn't leave it on. I had similar results. My partner also tried this wash. He has quite oily skin with large pores and suffers from roseacea at times. He loved this cleanser more than some of the expensive ones I have bought for him. Don't use too much water before applying as it thins out the gel a lot, just slightly dampen your face so the product stays on your skin and you can work it in easier. People with slightly oilier skin types looking to clear up they're skin while keeping it hydrated. When I received the product, instantly it reminded me of a lot of existing products on the market. 3-in-1 clay washes/masks and scrubs just isn't a new concept, and I have seen many brands come out with similar products. For this to be good, it would need to be exceptionally different to the other comparative products on the market. I prefer the wash function. The scrub is a little much for my skin on a regular basis and with masks that I really need to do in the shower, quite honestly I don't have the patience for them. The product left my skin feeling exfoliated and refreshed after use. The product was easy to use, however I would recommend using it in the shower. I have combination skin, and unfortunately this product dried out my skin significantly. Overall, the product had a good scent, ease of use, it is multi purpose and provides the desired results. Unfortunately, it is simply comparable to the same products on the market, and therefore I can't rate it above a 3 star, where it does not perform any different. I'm a big fan of using clay products on my skin as I like giving my skin a deep cleanse. This is a 3 in 1 product which can be used as a cleanser, exfoliator and a quick deep cleansing mask. I used it in all 3 ways to try it out however I found that on my combo-dry skin, sticking to cleanser/exfoliator worked best. The consistency of the product is actually quite thick for a cleanser and I was quite surprised at how smooth it was. Once applied to damp skin, it smooths out easily but it doesn't really have a lather. There are very tiny exfoliating particles and a mild scent. On my combo dry skin, this cleanser works best as an exfoliator. The particles are small and not too abrasive. I love that I can exfoliate my skin at the same time as deep cleansing with the clay properties. My skin felt very fresh, soft and supple. I wouldn't recommend using this as a daily cleanser as it may be too abrasive but this hits the mark as a once a week exfoliator.